The Hot QuickCoders are a unique contact coding machine and can be adapted for either manual printing or automated product coding! With it's unique ability to mark moving as well as stationary products, the Hot QuickCoder has the ability to be used in both manual and automatic applications while still offering extremely low maintenance and operating cost. This system can be used instead of an inkjet - removing the need for messy inks, constant maintenance and high expense. You can purchase about 3 or 4 Hot QuickCoders for the price of 1 base model CIJ. You can also use this system in place of a hotfoil coder or a rotary coder - installed in an incredible amount of different applications. No matter what application you require, the standard Hot QuickCoder package can cope. The set comes complete with mounting bracketry needing only 2 mounting points for installation on any angle - printing from the top, side, bottom or at various rotations. The control unit can be mounted separately from the printing unit to achive easy access away from the printing location. One of the most attractive features of the Hot QuickCoders is the inking system. NO blockages or startup flushing & "priming"
With the specially designed "butterfly touch" mechanism, it is possible to print up to 300 codes per minute onto moving products to a maximum speed of 60 meters per minute! - WITHOUT needing any special modifications or additions. 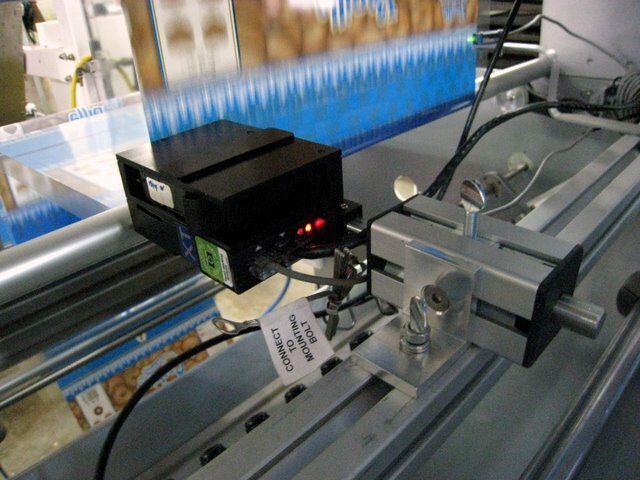 Therefore it is possible to replace an inkjet printing directly onto bottles travelling on a conveyor line, or use the HQC to print onto packing films on a vertical or horizontal form-fill-seal or flow packing unit. As an offline coder the HQC unit is an excellent alternative. Mount the unit on a worktable and slide the item underneath OR mount the unit UNDER the worktable for "bottom-up" marking - keeping your workspace clear. Trend have even been able to mark onto filled crisp packets with a simple worktable as shown. Therefore for smaller businesses the coder can grow from manual printing to automatic printing as your business grows - NO NEED to buy different printers. Often when printing on soft-walled products like disposable plastic bottles, the HQC unit compresses the side upon contact and can therefore print horizontally along the curve as shown. However, it is also possible to print vertically down a curve using the concave typeholder, which simply fits any standard HQC machine. Similarly the convex typeholder can print onto inwardly curving surfaces such as the bottom of bottles or cans as shown on the left. The HQC uses rubber or silicone characters with an interlocking base to slot into the HQC standard typeholders. Use a custom-made logo type to print any special logo like your company logo. It is possible to insert a custom logo and changeable text in one holder for a single print, withing the maximum printing area of area of 12 x 24 mm. Instant, no-mess ink colour changes? Choose HQC.